Benton visser moved the city playground equipment this fall. The previous location was located half on city property and half on private property. There was no documentation available for rent of the private property. If an accident were to happen our insurance would not have covered it. So now we have been informed by the insurance company that we need a lot more gravel around the playset. And that the swings need to be seperated from the playset too. 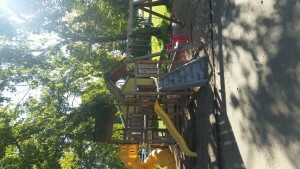 We have received a grant from excel energy to upgrade our park for $1000+. We are planning on building a set of swings on the south east side of the park. You will be seeing the new park changes next year.